Welcome to Grapevine Physical Therapy & Sports Medicine's patient resource about Shoulder problems. The shoulder is an elegant piece of machinery. It has the greatest range of motion of any joint in the body. However, this large range of motion can lead to joint problems. Understanding how the different layers of the shoulder are built and connected can help you understand how the shoulder works, how it can be injured, and how challenging recovery can be when the shoulder is injured. The deepest layer of the shoulder includes the bones and the joints. The next layer is made up of the ligaments of the joint capsule. The tendons and the muscles come next. 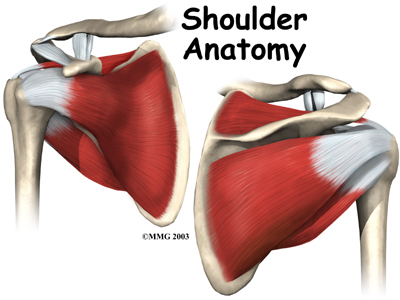 The important structures of the shoulder can be divided into several categories. The bones of the shoulder are the humerus (the upper arm bone), the scapula (the shoulder blade), and the clavicle (the collar bone). 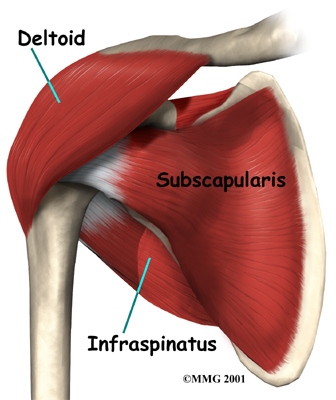 The roof of the shoulder is formed by a part of the scapula called the acromion. There are actually four joints that make up the shoulder. 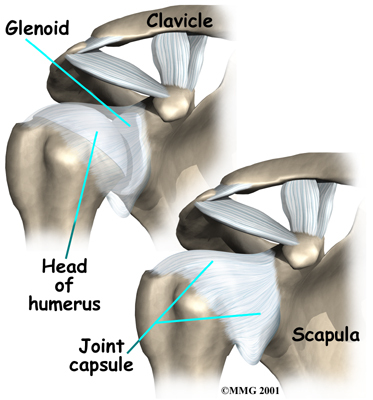 The main shoulder joint, called the glenohumeral joint, is formed where the ball of the humerus fits into a shallow socket on the scapula. This shallow socket is called the glenoid. 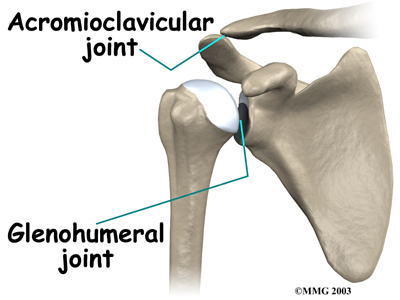 The acromioclavicular (AC) joint is where the clavicle meets the acromion. 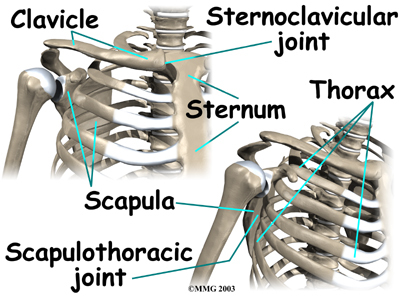 The sternoclavicular (SC) joint supports the connection of the arms and shoulders to the main skeleton on the front of the chest. A false joint is formed where the shoulder blade glides against the thorax (the rib cage). This joint, called the scapulothroacic joint, is important because it requires that the muscles surrounding the shoulder blade work together to keep the socket lined up during shoulder movements. Articular cartilage is the material that covers the ends of the bones of any joint. Articular cartilage is about one-quarter of an inch thick in most large, weight-bearing joints. It is a bit thinner in joints such as the shoulder, which don't normally support weight. Articular cartilage is white and shiny and has a rubbery consistency. It is slippery, which allows the joint surfaces to slide against one another without causing any damage. The function of articular cartilage is to absorb shock and provide an extremely smooth surface to make motion easier. We have articular cartilage essentially everywhere that two bony surfaces move against one another, or articulate. 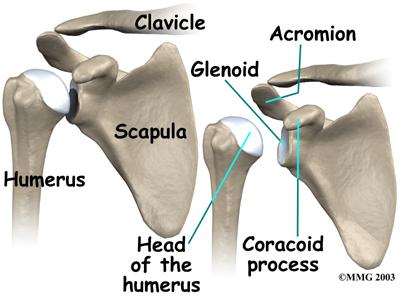 In the shoulder, articular cartilage covers the end of the humerus and socket area of the glenoid on the scapula. Ligaments attach the clavicle to the acromion in the AC joint. Two ligaments connect the clavicle to the scapula by attaching to the coracoid process, a bony knob that sticks out of the scapula in the front of the shoulder. A special type of ligament forms a unique structure inside the shoulder called the labrum. The labrum is attached almost completely around the edge of the glenoid. When viewed in cross section, the labrum is wedge-shaped. The shape and the way the labrum is attached create a deeper cup for the glenoid socket. This is important because the glenoid socket is so flat and shallow that the ball of the humerus does not fit tightly. The labrum creates a deeper cup for the ball of the humerus to fit into. The labrum is also where the biceps tendon attaches to the glenoid. Tendons are much like ligaments, except that tendons attach muscles to bones. Muscles move the bones by pulling on the tendons. The biceps tendon runs from the biceps muscle, across the front of the shoulder, to the glenoid. 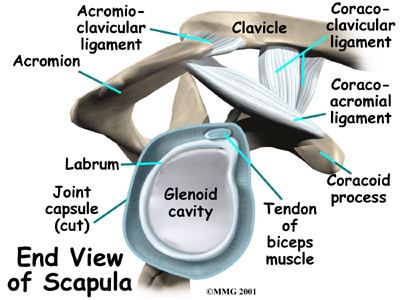 At the very top of the glenoid, the biceps tendon attaches to the bone and actually becomes part of the labrum. This connection can be a source of problems when the biceps tendon is damaged and pulls away from its attachment to the glenoid. The tendons of the rotator cuff are the next layer in the shoulder joint. Four rotator cuff tendons connect the deepest layer of muscles to the humerus. 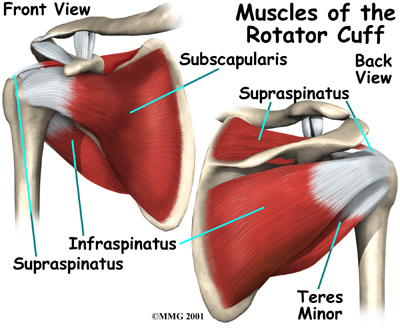 The rotator cuff tendons attach to the deep rotator cuff muscles. This group of muscles lies just outside the shoulder joint. These muscles help raise the arm from the side and rotate the shoulder in the many directions. They are involved in many day-to-day activities. The rotator cuff muscles and tendons also help keep the shoulder joint stable by holding the humeral head in the glenoid socket. All of the nerves that travel down the arm pass through the axilla (the armpit) just under the shoulder joint. 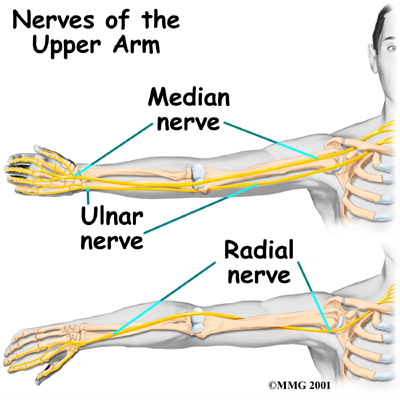 Three main nerves begin together at the shoulder: the radial nerve, the ulnar nerve, and the median nerve. These nerves carry the signals from the brain to the muscles that move the arm. The nerves also carry signals back to the brain about sensations such as touch, pain, and temperature. Traveling along with the nerves are the large vessels that supply the arm with blood. The large axillary artery travels through the axilla. If you place your hand in your armpit, you may be able to feel the pulsing of this large artery. The axillary artery has many smaller branches that supply blood to different parts of the shoulder. The shoulder has a very rich blood supply. 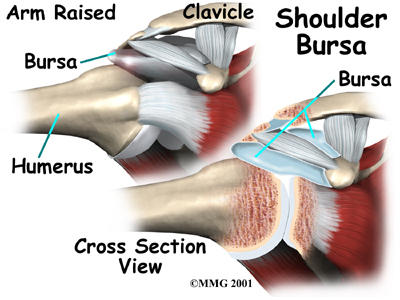 Sandwiched between the rotator cuff muscles and the outer layer of large bulky shoulder muscles are structures known as bursae. Bursae are everywhere in the body. They are found wherever two body parts move against one another and there is no joint to reduce the friction. A single bursa is simply a sac between two moving surfaces that contains a small amount of lubricating fluid. Think of a bursa like this: If you press your hands together and slide them against one another, you produce some friction. In fact, when your hands are cold you may rub them together briskly to create heat from the friction. Now imagine that you hold in your hands a small plastic sack that contains a few drops of salad oil. This sack would let your hands glide freely against each other without a lot of friction. As you can see, the shoulder is extremely complex, with a design that provides maximum mobility and range of motion. Besides big lifting jobs, the shoulder joint is also responsible for getting the hand in the right position for any function. When you realize all the different ways and positions we use our hands every day, it is easy to understand how hard daily life can be when the shoulder isn't working well.